Mark Sisson, author of the 2009 best seller, The Primal Blueprint, and de-facto leader of the primal/paleo lifestyle movement, expertly applies primal lifestyle principles to the unique challenge of endurance training and racing. Unlike the many instant and self-anointed experts who have descended upon the endurance scene in recent years, Sisson and his co-author/business partner, Brad Kearns, boast a rich history in endurance sports. Sisson has a 2:18 marathon and fourth-place Hawaii Ironman finish to his credit, has spearheaded triathlon's global anti-doping program for the International Triathlon Union, and has coached/advised leading professional athletes, including Olympic triathlon gold and silver medalist Simon Whitfield and Tour de France cyclist Dave Zabriskie. Under Sisson's guidance, Kearns won multiple national championships in duathlon and triathlon, and rose to a number-three world triathlon ranking in 1991. Primal Endurance applies an all-encompassing approach to endurance training that includes primal-aligned eating to escape carbohydrate dependency and enhance fat metabolism, building an aerobic base with comfortably paced workouts, strategically introducing high-intensity strength and sprint workouts, emphasizing rest, recovery, and an annual periodization, and finally cultivating an intuitive approach to training instead of the usual robotic approach of fixed weekly workout schedules. ©2016 Primal Nutrition, Inc. (P)2016 Primal Nutrition, Inc.
Would you listen to Primal Endurance again? Why? Yes, loaded with tons of useful information. What other book might you compare Primal Endurance to and why? Possibly "Grain Brain" or "Keto Clarity" it seems to provide revolutionary information that just isn't mainstream yet. What does Brad Kearns bring to the story that you wouldn’t experience if you just read the book? Its a long book and he makes it very entertaining to listen to! I thought the information was incredible. This book absolutely needs PDF. There is so much information in there and would make it so much easier to follow after you finish. Please get this done! Otherwise great book! Wish it had a PDF included. Good book but missing the Graphical representation it mentions repeatedly. Honestly it should be a no brainier that if I purchase the audio book or PDF it should be a combo buy if graphics are always mentioned. There are many solutions to this problem like. Just provide the Charts and tables mentioned only. Or host the PDF charts and tables online. Another solution combo the PDF and audio book together if the author insist on referring the charts and tables repeatedly. I almost purchased the 21 day plan from audible but glad I did not since many reviews stated that it referred so much to graphics that the audiobook was a huge waste of time and money since the book cannot stand on its on in audio. To me that's a big fail. Audio is the least resistance path to gaining the knowledge in a book based off time and reading level. It should have a bigger audience at least for fiction. Non fiction should not be hindering this by providing an incomplete version of the authors work. Especially if the price is basically the same. Perhaps I will start an audible spinoff that addresses this issue. If I can do just that better perhaps I too can become like Mark Cuban. 75 sur 80 personne(s) ont trouvé cet avis utile. 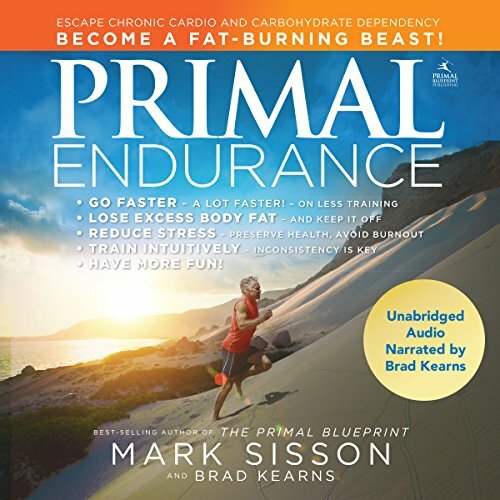 Would you consider the audio edition of Primal Endurance to be better than the print version? NO...I believe the print would bet better. What didn’t you like about Brad Kearns’s performance? Nice voice but after the constant repeats became annoying. The information regarding running and heart rate was very informative. I am a tell me once and I get it type of person. This book was too wordy and everything was repeated to such a level I felt I caught myself rolling my eyes. "Not again...."
A very different way of training! This book challenges the traditional thinking of endurance that it's all about the miles and to push through the pain. Perfect for an aging athlete like myself. There's so much totally sensible information in this book that it demands a second listen - this HAS to be legit - sugar and grains have always made me feel bad - like a hangover the next day - as an endurance junkie, this is my new roadmap. Sisson once again explains a method of fitness and nutrition that totally makes sense. Our bodies are not designed to constantly throw kindling on the fire. Wouldn't you rather slowly burn that big log for all your energy needs? Excellent resource. Thanks again Mark. I've learned so much, enjoyed every chapter! I felt as if the narrator is talking to me. Changed my whole thinking about running. I needed that. The wave of the future is now presenting itself and Mark & Brad are on the forefront with their knowledge and experience. Well spoken and easy to follow, my endurance training will now take a new approach! Thanks gentlemen for your knowledge and expertise on the Primal Plunge! Absolutely a great philosophy of getting stronger (lean and mean) while remaining healthy. Nobody wants to sit on the sideline from the epidemic of overtraining.